In his blog Juan of Words, Juan posed the question: "Is it becoming more acceptable, even more popular maybe, to raise bilingual children in this country?" According to the Hispanic marketing journals and books I've read, the speakers I've heard on the subject, the answer is YES. There is actually a movement called "Reacculturation." Acculturated or Assimilated. 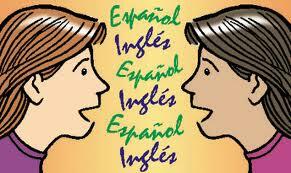 Hispanics want to learn Spanish or they want for their children to learn Spanish. I know because I'm one of those Hispanics. Image borrowed from Greenberg Art. If you would have asked me back then if I planned on teaching my children Spanish my answer would have been a definite YES, no doubt about it. In fact, I frowned upon Hispanics who did not teach their children Spanish. I grew up fully bilingual and probably learned both languages at the exact same time, so I am a firm believer in raising bilingual children. I speak, read and write Spanish fluently. Then I had a child. Easier said than done. I made arrangements with this wonderful babysitter who agreed to take care of my baby every day while I went to work. The best thing about her? She spoke Spanish! I was so excited! Yes, I speak Spanish, but my husband didn't speak Spanish so we didn't really speak Spanish together in the home. I figured that by having a sitter speak to her in Spanish all day my daughter would naturally speak Spanish like me. Wrong. It didn't quite work that way. By the time my daughter really started talking in full sentences (at age 2 for her) they were all in English. I realized that she was speaking in English to the sitter and the sitter was responding in Spanish. That's how it went with them all day long. Then she came home to Mommy and Daddy and all we spoke was English. Somewhere along the way I read an article that said that children identify with the language spoken by their mother. Well, there went my plan out the window! I had been speaking nothing but English at home, thinking that my children were hearing Spanish all day. Here I am years later. My daughter is 11 and my son is 8. They do not speak Spanish. But do they understand Spanish? I think so. Somehow they always seem to follow along with the conversation when I'm speaking to someone in Spanish and without even realizing it they follow up with a comment in English afterwards regarding my conversation. I know that if I can just make myself speak to them in Spanish a few days a week they will start speaking Spanish. I keep telling myself that deep in the back of that smart brain of theirs they remember. They know Spanish. I will keep telling myself that until they do.